Michigan’s new governor is preparing for her first State of the State address. 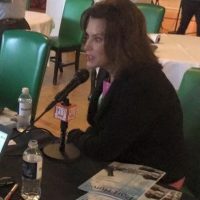 It has been announced that Gretchen Whitmer will address residents on February 5 at 7:00pm during a joint session at the Michigan House and Senate at the State Capitol in Lansing. The State of the State address will give Whitmer an opportunity to discuss her agenda as governor to a statewide television audience. Whitmer was sworn in as Michigan’s 49th governor January first.